I have been using a Raspberry PI as a media center with Kodi (OpenELEC) since it came out. It is a wonderfully (cheap) media player, but the performance can be lacking from time to time. Last year I decided to look for an alternative and because I am developing games, I wanted a media player that can also be used as a kind of console/testing device with a controller for the big screen. After some searching on the net I read that Google had been working on the Android TV platform and was going to release the Nexus Player. Unfortunately there where no plans for a Europe release, so I would have to import one. Then I discovered that Google handed out developer kits named ADT-1 to developers in the US. Since I had to import the device anyway, I went to eBay and bought one. I hooked it up to my TV and installed the Kodi apk via wifi. It was working perfectly. My first game, although not ready for controller input, worked surprisingly well thanks to the OpenFL platform. The only downsides where that the game icon was not visible on the home screen and that it was not available in the Android TV Play Store version. This post explains how I learned to make apps Android TV ready. To make this explanation easier to understand, I decided to create an example application on GitHub. Following the official guide to make your app Android TV ready and visible in the Play Store on your device, you need to alter the xml-file on multiple places. First you need to add this filter to your MainActivity to enable your app for TV and make the app icon available on the TV home screen. You need to tell the app that it can be used on other devices than mobile. Add the following lines to the template. The first adds leanback launcher support for the app to be visible on the launcher menu. Set this to required=”true” when your are making a TV-only app. The second declares that your app is compatible with devices without touch screens (TV’s obviously). Then add the android:logo attribute to the application element in the AndroidManifest.xml. The official guide suggests using android:banner , but this was not working for me. 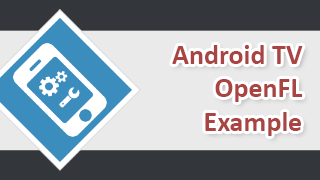 Also the native test application in Android Studio uses android:logo , so I would stick to that for now. If you now run the app it will show up nicely with our banner image on the menu. By default it will show in the ‘Apps’ category. If you are using OpenFL you are probably creating a game and want your app in the ‘Games’ section. How do we do that? This is a new setting introduced in Android 5.0, so be aware that your app now needs SDK 21 or it will give an error on compilation. You can set the SDK version in your project xml. 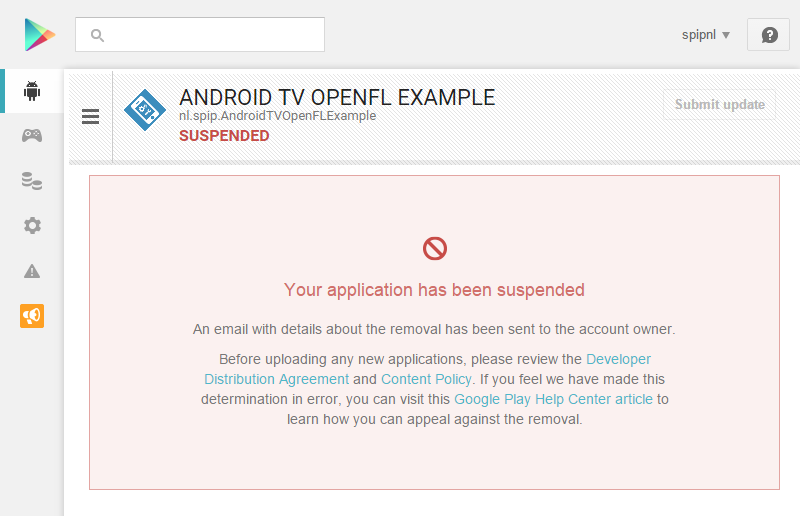 You now have made your OpenFL game Android TV ready! 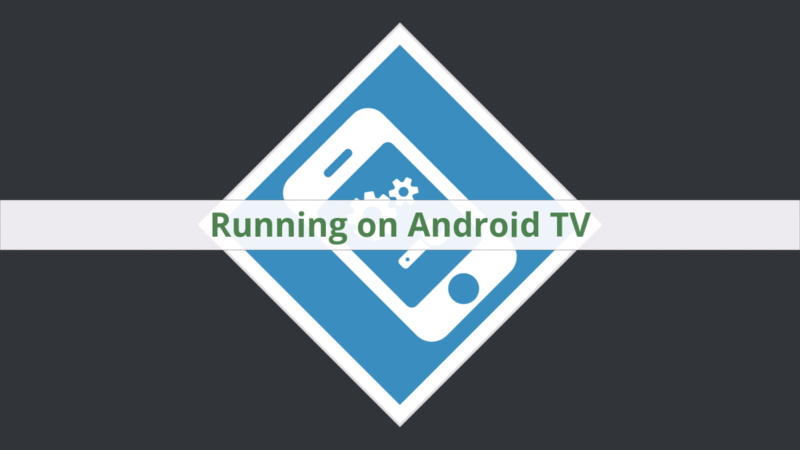 Is running on Android TV? I have created a simple native extension that reads the Mode Type and checks if it is equal to the Android TV constant (UI_MODE_TYPE_TELEVISION). This was my first attempt of creating an OpenFl native extension, so I needed some help. I followed this tutorial and generated the example extension from lime and renamed it to android-mode-type. Using the example code from the Android Developers guide I created a method to retrieve the Mode Type. The variable mainContext is a static variable in the org.haxe.extension.Extension class which contains the context of the current Activity. It simply returns the integer currentModeType. And I created a second method to check the mode type against the Configuration.UI_MODE_TYPE_TELEVISION constant. The Haxe part of the extension has a method called isAndroidTV() that calls the Java method with the same name if the app is running on Android and sets the result. If it is not running Android it will always return false. On other (Android) devices and platforms it will show a red text saying ‘Not running on Android TV’. I wanted to verify that my example app was visible in the Android TV version of the Google Play Store, so I submitted it to the Play Store with the appropriate details. After everything was done and I pressed ‘submit’ I received an email from Google telling me that the app was violating the spam provisions of the Content Policy and it was suspended from the Play Store. Happy coding and if you have any questions or if this helped you out, you can always leave a comment below. Previous story Finished my first game!